News is breaking today that a fake Twitter account for the wife of Rupert Murdoch, Wendi Deng Murdoch, which was verified by Twitter was actually a fake account. According to The Next Web story the account was verified automatically by Twitter and with no contact with the account owner. That verification status has now been removed however the account itself is still up and running. Whoever the voice is behind the tweets is also very active and entertaining media interviews it would seem by following their timeline. However, as you can tell by the title of this story, this is not about the fake account but the verification process by Twitter. They apparently validated this account on some level and took it for real but without apparent contact with the owner of the account how did they determine it was for real? 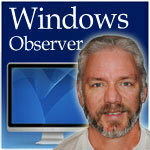 Windows Observer twitter, Windows Observer. permalink.